A new Android smartphone from telecom company Yota boasts a full LCD screen with a second screen on the rear that uses e-ink to post information and notifications with very little battery drain. The handset will launch in five countries in time for the holidays, with larger distribution throughout Europe in early 2014. YotaPhone runs Android Jelly Bean 4.2.2 with a dual core 1.7 GHz Krait processor. The capacitive multi-touch main screen boasts a 4.3-inch 720×1280 LCD display capable of producing 16.7 million colors. A second rear screen also measures 4.3-inches with a 360×640 EPD, 16 grayscale display. The e-ink screen is not touch-sensitive, however there is a capacitive touch zone below that receives gesture controls such as scrolling through different information displays. Both screens sit behind Gorilla Glass, a scratch and shatter-resistant surface made by Corning. The e-ink display serves a dual purpose: battery conservation and a persistent information display. The e-ink display draws no battery power as long as it’s static and consumes little battery resources to change the display. Users can transfer images and information from the smartphone’s LCD display to the e-ink display with a gesture; the image will remain on the screen until it is changed. This information can vary from a mapped location, a weather forecast or an eBook that readers can scroll through. Dynamic information can also be displayed on the e-ink screen such as incoming caller information, text messages, calendar alerts and other reminders. As the phone is an Android device, developers can create apps that will cater to the rear screen. The e-ink screen is in response to user demand for information. “The typical user picks up and activates their smartphone more than 150 times a day,” said Yota Devices chief executive Vlad Martynov, according to BBC News. “Why? Because users worry that messages or information they need or want are hidden behind their phone’s black screen. This is a huge distraction and can impede meaningful interaction with our friends, families and colleagues,” he added. This is Russian telecom company Yota Devices’ entry into the handset market. The company has made a name for itself by making modems and router equipment in the past. The company is also responsible for 4G mobile broadband services within Russia, The Telegraph UK reports. A second screen on a smartphone might be seen as a novelty, however it has its uses. 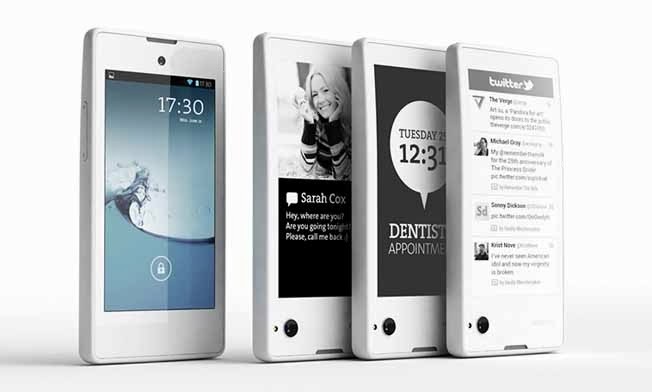 “The YotaPhone is an ambitious concept and although it will be considered a gimmick by many we believe there is merit in the design,” BBC News quoted Ben Wood, a mobile analyst with research firm CCS Insight. Additional specs for the phone include a 13 MP camera with an LED flash, and a 1MP front camera. The handset is capable of capturing 1080p video at 30fps. It’s also built with an accelerometer, compass, gyroscope, proximity sensor, and an ambient light sensor, among other features. By Christmas the phone will be available in Russia, Austria, France, Spain and Germany. It is expected to be available in 15 other countries by the end of the first quarter of 2014. In the UK the YotaPhone will only be available from YotaPhone’s online shop, according to The Telegraph.